If you were near Stewart Stadium on the morning of Aug. 21, you may have noticed the alarming amount of police cars, emergency personnel and local law enforcement agencies surrounding the southwest corner of the football field. This was in association with the Weber State University police department’s annual emergency response training exercise. Every year before the start of a new semester, WSU’s Office of Emergency Management and Planning organizes a simulated program in order to test the functionality of emergency respondents throughout the campus and surrounding community. These programs are to ensure emergency respondents can act quickly and efficiently in response to a myriad of possible crisis situations. The rise in frequency of mass shootings has been a cause of concern for almost every public institution throughout the nation, one of the most prominent being educational establishments. According to CNN News, this year has already experienced 23 school shootings in which a victim was injured or killed as of May 2018. That equates to approximately 1 shooting every week. 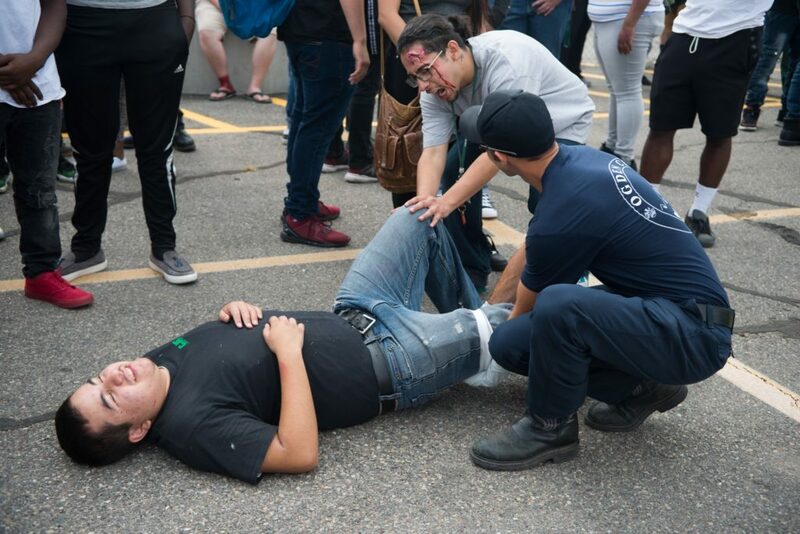 WSU’s drill this year took the form of possible scenarios in mimicking an active shooter at a public gathering as well as a protest-riot scenario. 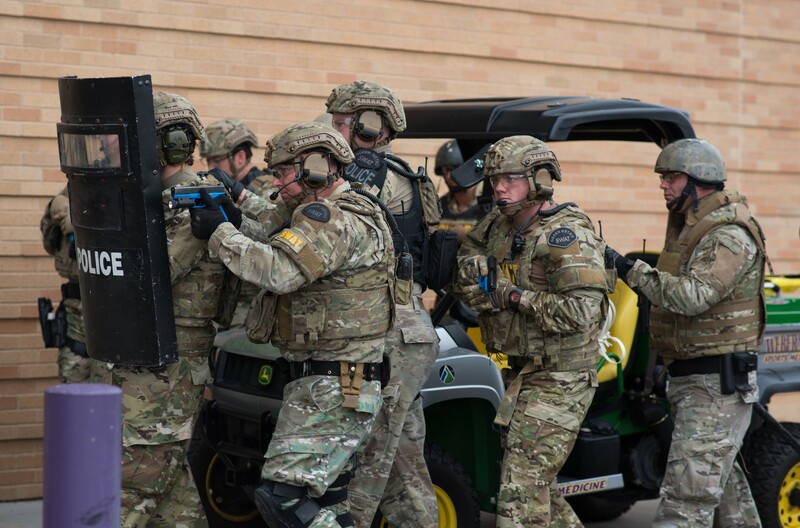 With cooperation from variety of agencies on and off campus such as the Ogden police, Weber County Sheriff, Roy City police and even Metro SWAT and Civil Disorder Unit, the operation was one of the largest multi-functional training exercises in recent years for WSU law enforcement. “We’ve been planning for a year to bring all of the disciplines together so we can make sure that this goes off smooth. That way, if there is ever an actual crisis, we’re all working together on the same page and we’re communicating well” WSU chief of police Dane LeBlanc said. The exercise began at 9 am with an emergency personnel briefing, before authorities began staging a public gathering. 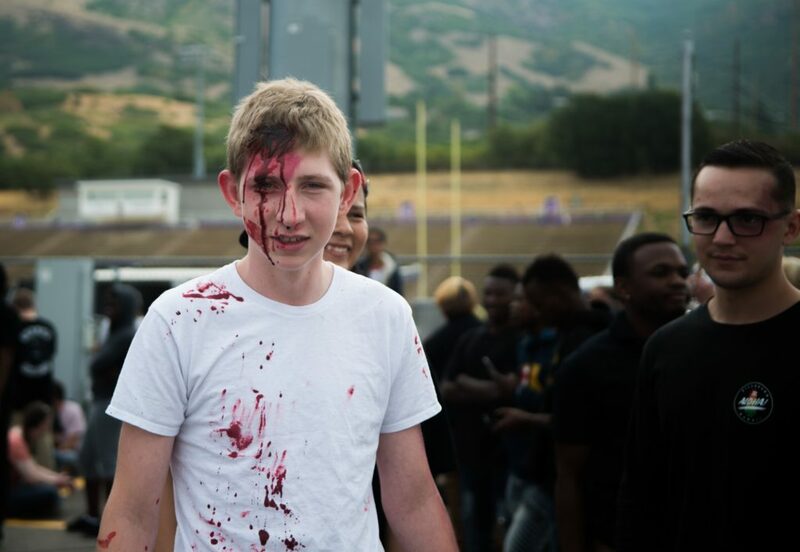 Volunteers from the Clearfield Job Corps converged on the stadium field to simulate a riot while members of the Civil Disorder Unit retaliated in full protective gear. After the protest scenario, preparation began for the imitation of an active shooter situation. 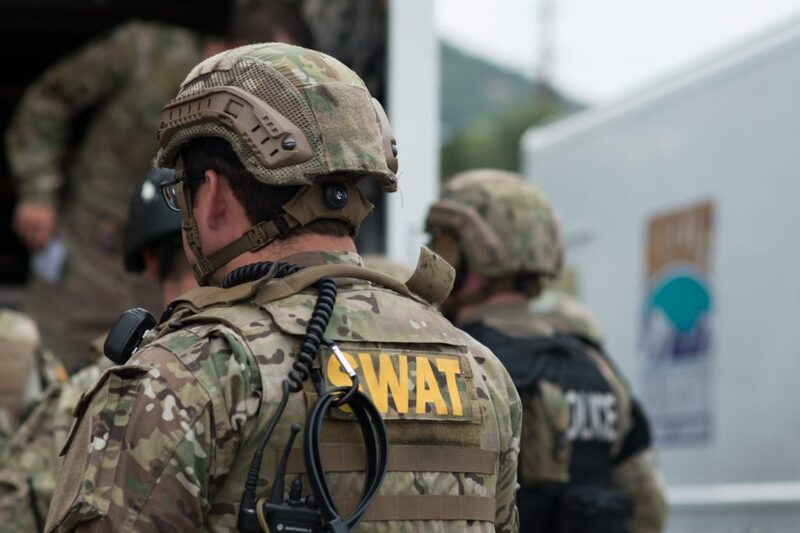 At 10 am “shots were fired” and the Ogden Metro SWAT team began their routine sweep of the stadium as they would in the event of a real emergency. 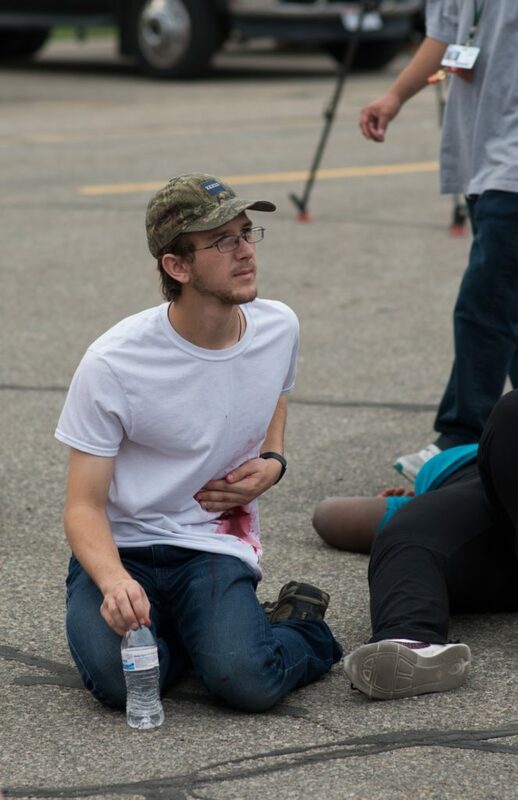 Volunteers who were assigned to play the role of injured individuals were treated for their wounds (which were painted on with fake blood) and transported to McKay-Dee Hospital and Ogden Regional Medical Center. After the threat was subdued and the victims were tended to, members of the communications, logistics, finance, legal and liaison teams met for a briefing in the Public Safety building on campus to review the exercise and discuss the performance of each department during the drill. Overall, the training went off without a hitch and emergency professionals were able to respond to the situation effectively and in a timely manner. However, in a world filled with turmoil and and violence, university campuses across the United States continue to search for new ways to update their security and safety protocols. “You look at what’s going on today and it’s something that we need to be ready and prepared for and hope that we never have to deal with it” Leblanc said. Despite arguments concerning violence prevention and gun control, it is important for potential victims as well as respondents to be equipped with the necessary skills to survive once a dangerous situation has already arisen. 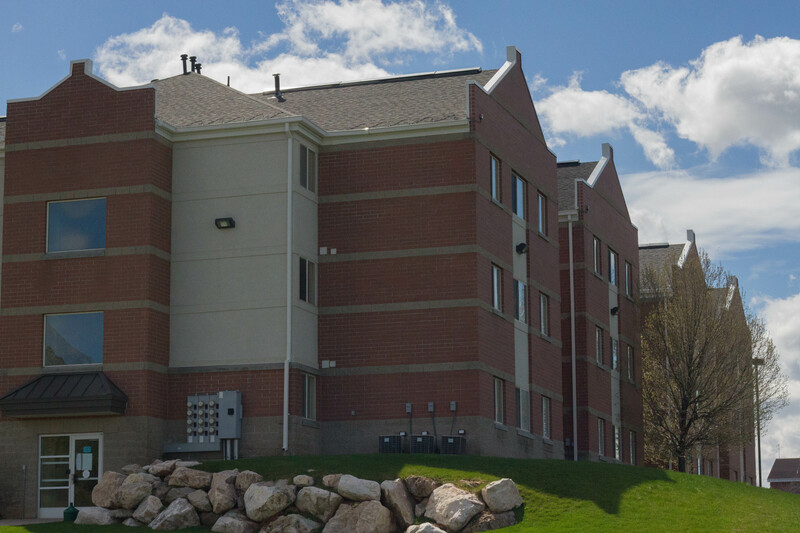 At Weber State, the campus police have provided multiple resources to help students with this and insure that those who need to be saved are just as prepared as those who do the saving. A “Shots Fired” course is available to all who are interested and focuses on employing individuals with knowledge on recognizing and surviving an active shooter circumstance. In addition, ALERT CRASE is another program dedicated to civilian response in active shooter events and can range from one to four hours in length depending on the schedule of the student or faculty member. 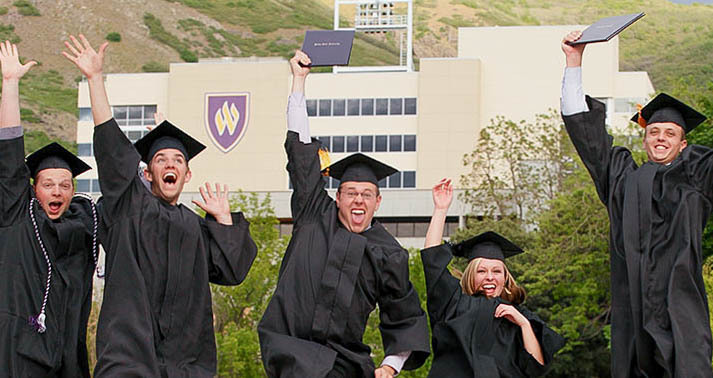 To learn more about the safety courses that WSU supplies or set up a class time, you can contact the Weber State Police Department or visit the Public Safety Building. Another crucial amenity that all students at Weber should be aware of is the campus Code Purple Emergency Notification System. Code Purple is Weber’s primary source of communicating with students and faculty in emergency and weather related events. Incidents such as criminals on school grounds, lockdowns, shelter during hazardous climate and campus closures are some of the key events that have alerted students in the past. 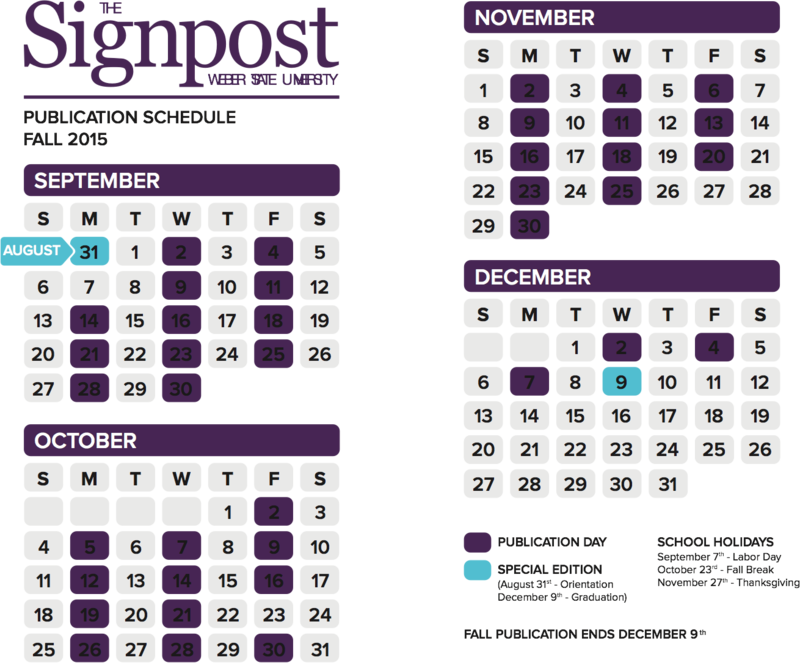 In order to sign up to receive Code Purple notifications, enter or update your Weber contact information by visiting https://www.weber.edu/codepurple. Students who register will only receive alerts in the event of a real emergency or police training exercise. “Our code purple system is our most viable method of getting an emergency message out and texting is most reliable so we want our students to provide us with their cell phone numbers and click on our text messaging feature so they can receive those messages quickly,” LeBlanc said. By keeping students informed and emergency respondents on their toes, the WSU police are hopeful that if the school is ever faced with a threatening situation, everybody will remain safe and unharmed. If you know of a crime or suspicious activity taking place on campus, it is critical that you contact local authorities or inform the Weber State Police Department at 801-626-6460. Emergency phones are also placed throughout school grounds in certain parking lots and public spaces. “It’s important that our campus community and our local communities know that we are all working together to make sure that we are trained and prepared,” Leblanc said.